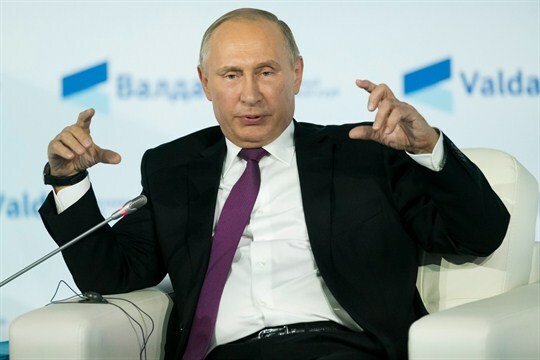 Russian President Vladimir Putin gestures while speaking at the plenary session of the annual meeting of the Valdai International Discussion Club, Sochi, Russia, Oct. 19, 2017 (AP photo by Alexander Zemlianichenko). When World War II ended in 1945, the United States hoped that wartime cooperation with the Soviet Union would continue. The dream of then-President Franklin Roosevelt was for an enduring partnership of the victorious great powers acting together to prevent future world wars. But this was not to be. Whether ideological differences between the Soviet Union and the United States doomed postwar cooperation from the start, or the idea was deliberately sabotaged by Soviet Premier Joseph Stalin, Washington and Moscow were soon locked in the Cold War.